LOL @ the office dress code! Good stuff, MJ! Poor Dr Prescott! The blonde patient looked a siren! Oh, how I would love to read some of these books you post about! Someday maybe I'll start my own book collection *Looks over at the years and years of books occupying the bookshelf* Maybe I already have. Hilarious! 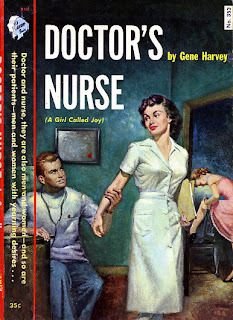 But if hot-to-trot doctors and nurses all behaved themselves the TV industry would be out of business. They would have to to produce shows about nice, professisonal people taking good care of patients and nobody would watch. Love it, MJ! Thanks for making me laugh on this cold Monday morning. LOL! I must confess I do LOVE the office dress code. Wonderful read!